This illustration of cowboys “Loading Texas Cattle in Abilene, Kansas,” America’s first “cow town,” was published in an 1871 issue of Frank Leslie's Illustrated Newspaper. Public Domain. When America’s Civil War was over, Texas cattle owners did their best to move their stock north. But as herds of Longhorns moved across Missouri, locals objected. Not only did Missourians dislike the way huge numbers of cattle were trampling over their land, they worried about the spread of disease. What if ticks, which bit the Longhorns, spread disease to the local herds? Sensing an opportunity from the impasse, between cow herders and locals, a businessman named Joseph G. McCoy had an idea. What if he could persuade officials from the Kansas Pacific Railroad to build a cattle siding at Abilene, Kansas? Cowboys could then move the cattle over established trails, reaching Abilene where the herds would be sent, via rail, to northern stockyards. McCoy paid a visit to Abilene to further check-out his idea. What did he find there? Abilene could be transformed, however, depending on the reaction of railway officials. When railroad decision-makers agreed with his plan, McCoy built a stockyard complex where the cattle could be held before they were loaded onto rail cars. He then encouraged Texas ranchers to start moving their stock to Abilene. By 1867, McCoy was shipping around 35,000 head of cattle ... but that was just the beginning. Within four years, cowboys were annually driving around 600,000 Texas Longhorns to the Abilene stockyards. Many of the cattle drives were over the Chisholm Cattle Trail. The first person to use that dirt track—to get Texas cattle from San Antonio to Abilene—was a man named O.W. Wheeler. In 1867, he moved around 2,400 steer north. Abilene became America’s first true “cow town.” From there, stockyard-bound cattle traveled, “on the hoof,” to cities in the north and east of the country. Chicago’s stockyards, for example, became famous in their own right. As more and more cowboys herded more and more cattle through Abilene, however, the locals were growing tired of all the noise, all the wildness and all the smells. They asked Wild Bill Hickok to do his best to tame the town, but his best wasn’t good-enough. Wild Bill implemented some gun controls, but he was unable to establish the kind of peace residents wanted. As a result, the people of Abilene decided they’d rather give-up the income from the cattle-drive business in exchange for a better quality of life in their town. Not long after the boom year of 1871, Abilene’s cow-driving business went elsewhere—to “cow towns” like Ellsworth, Newton and Dodge City. 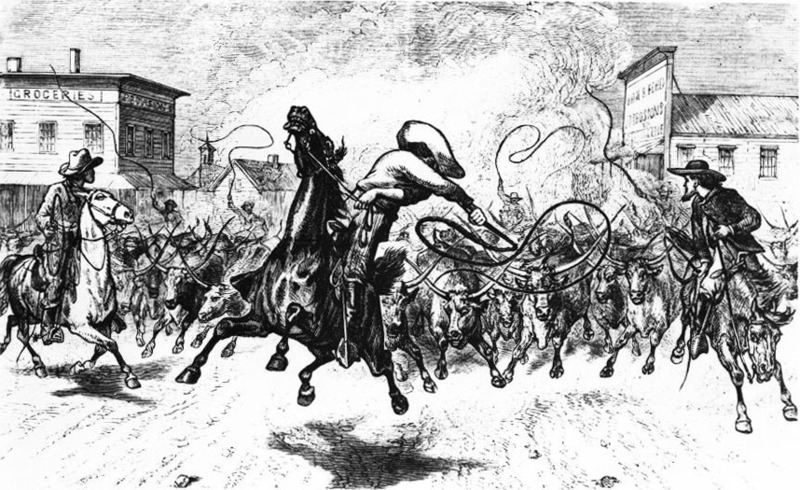 Edward Rapier illustrated what it was like for cow towns, such as Abilene and Dodge City, when the herds arrived. 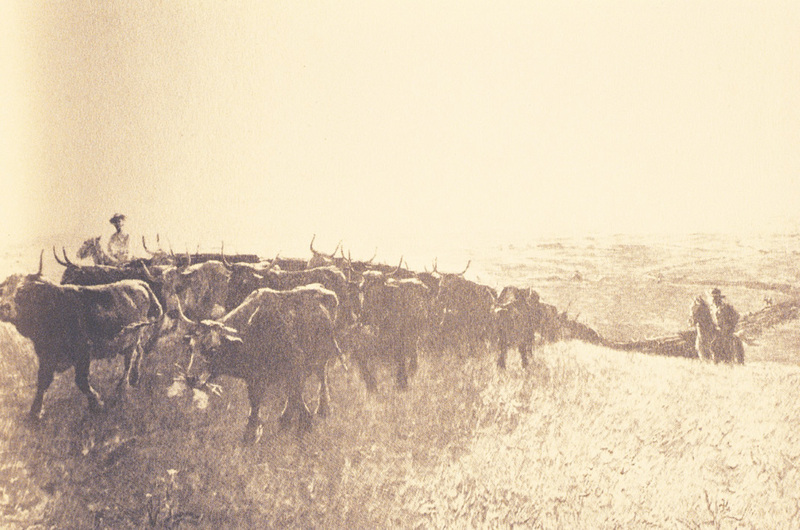 His drawing—"Longhorns in Dodge City, Kansas"—was published in Frank Leslie’s Illustrated Newspaper on the 27th of July, 1878. 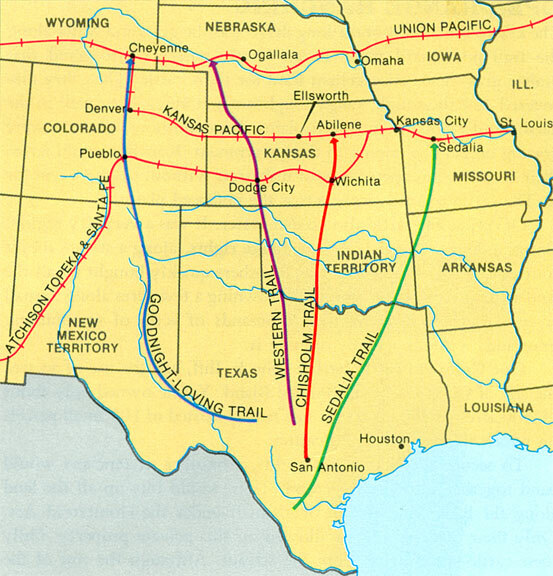 With Abilene’s decision to change its relationship with the cattle-driving business, the Chisholm Trail extended further into Kansas. By 1883, it had reached Wichita and Caldwell. The Chisholm Trail became so popular that by the time cattle-driving was a thing of the past, around 5 million cattle and around 1 million mustangs—not to mention all the cowboys guiding them—had moved across the dusty earth. The economic activity, generated by all the cattle drives, helped the South, particularly Texas, in its post-war recovery. What was it like for cowboys to drive their slow-moving cattle north? To answer that question, let’s step back in time for a closer look. 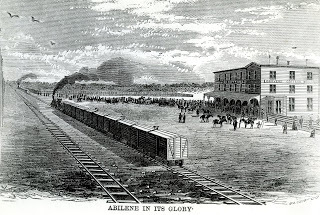 In-text image, of “Abilene in Its Glory,” features the railroad into town and Drover's Cottage. The original lithograph is maintained by the Dickinson County Historical Society. Bos, Carole "U.S. COW TOWNS and CATTLE TRAILS" AwesomeStories.com. Feb 18, 2015. Apr 21, 2019.